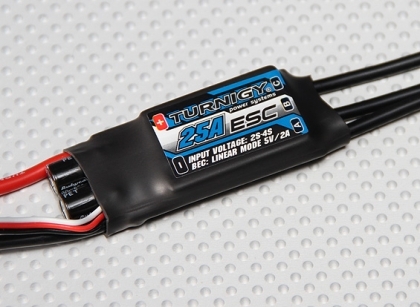 The Turnigy TY-P1 25Amp ESC is a stand out performer. Using quality IR HEXFETÂ® Power MOSFETs developed in the USA, this ESC is cable of handling current draw in excess of 40 amps. However this in house designed ESC was developed and produced by the HobbyKing engineering team with one goal in mind, quality and reliability. Rather than over rate the ESC and push it to the limit with a larger heat-sink, as many companies do, we wanted to design a Speed controller for those looking for a bullet proof solution. We use SMT technology rather than hand soldering to produce consistent quality and reliability each and every time. The TY-P1 25A ESC also features independent voltage regulators (One for the BEC and one for the MCU) this ensures the MCU will remain powered in the event of a high momentary amp draw from the BEC circuit and vise versa. An XT-60 battery connector and 3.5mm bullet connectors have been pre-soldered for convenience. Cut-off Voltage (Low / Middle / High ). Start Mode (Normal / Soft / Very Soft ). Timing Mode (Low / Middle / High). Cell (Auto, 2S, 3s, 4S). Note: Programming can be done via the Optional programming card. See related items below. This ESC requires the user to set the throttle range on installation. Please download the manual for further instructions.